Begin visual inspection at the top of the tree and work downward. Ideally, main side branches should be at least &frac13; smaller than the diameter of the trunk. For most deciduous (broadleaf) trees, don’t prune up from the bottom any more than &frac13; of the tree’s total height. Where possible, try to encourage side branches that form angles that are &frac13; off vertical that form “10 o’clock” or “2 o’clock” angles with the trunk. For most species, the tree should have a single trunk. Identify the best leader and later branches before you begin pruning and remove defective parts before pruning for form. Don’t worry about protecting pruning cuts. For aesthetics, you may feel better painting large wounds but it doesn’t prevent or reduce decay. Keep tools sharp. One-hand pruning shears with curved blades work best on young trees. For high branches use a pole pruner. A major job on a big tree should be done by a professional arborist. 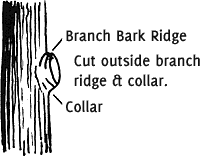 For larger branches, cut outside the branch bark and ridge collar (swollen area). Do not leave a protruding stub. If the limb is too small to have formed a collar cut close. 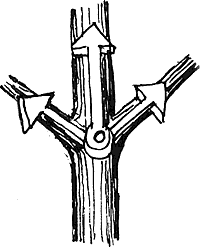 When simply shortening a small branch, make the cut at a lateral bud or another lateral branch. Favor a bud that will produce a branch that will grow in desired direction (usually outward). The cut should be sharp and clean and made at a slight angle about ¼ inch beyond the bud. Now that you know the pruning basics learn what steps you should take throughout your trees life. Learn what you prune annually.